Make sure you have checked the weather in the area you will be riding. Always take a cape or gillet in your back pocket to put on if the weather changes or you have to stop put this on to keep warm. Always wear slightly more clothing than you feel you need and you can always unzip or take clothing off during your ride. If it’s going to be sunny don’t forget to wear sunscreen not forgetting the back of your leg and hands. Tell someone what time you are expected to return. Have emergency phone number somewhere on you and any medical problems (Just in case you crash and not able to speak). Take care of your contact points (that’s your hands, feet and bum) but the main thing will be your bum; always wear cycling shorts that suits you best (the most expensive is not always the best for you) and if you are having trouble try different saddles. When you are starting your ride don’t fasten your shoes too tight, as your feet will swell a little during the ride. When riding always ride with gloves or mitts to help with sore hands and if your wrists hurt a lot then think about raising your handlebars a little or tilting your brake levers a little. Before you leave for your ride, make sure you give your bike a quick check making sure the brakes and gears are working. It’s easy to forget but mark sure the chain is not dry and the tyres are the right pressure. The most important thing to do before a ride is to eat properly as this is the fuel for the ride. Before the ride try to have a high carbohydrate meal around 1 to 2 hours before you set out to make sure your body has digested the food. Don’t eat too much as this will make you sleepy or there is nothing worse than that sick feeling as you start your ride. Having a high carbohydrate meal will fuel you for the first 90min but you should start feeding on the move if you are riding longer than this and recommendation are in the during part of this website. One or two spare inner tubes or even a puncture repair kit. Drinking bottle and rides over 1 hour some food. Gillet or wet weather cape. WHAT IS THE RIGHT AIR PRESSURE? The air pressure level should be selected depending on the weight of the rider and the way the tyres are used. Generally speaking, lighter riders require less pressure, heavier riders more. We usually recommend choosing a pressure level somewhere between the recommended and the maximum pressure. The maximum tyre pressure indicated on the side of the tyre may not be exceeded. Tyres that are pumped up too much will tend to crack. Wide tyres need less pressure than narrow tyres. If the pressure is too low, there is a risk that the tyre will be crushed if driven over a sharp edge, e.g. a hole in the road or a lowered pavement. Therefore, check and set the pressure correctly on a regular basis. How often do I have to check the air pressure? 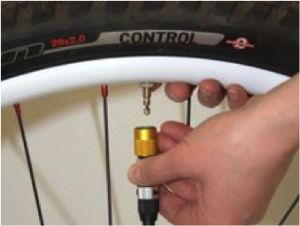 All bicycle tyre systems are subject to continuous pressure loss. The volume of air in a tyre is e.g. directly related to the air temperature around. Check the operating pressure and the condition of your tyres at regular intervals. Check the tyre pressure using a pump with a display (manometer) when the valve is at the 12 o’clock position. Also, check the position of the tyres on the wheel rims using the all-round tyre line. Continental recommends checking tyres every time before use, in particular, if Light and Supersonic tubes are used. Here are Bryan’s tips to keep you safe during a ride. Start your ride steady and have a good 20 minutes to making sure you are warmed up before start to pressing on little and try to plan your route so you don’t have a big hill in the first 10 minutes. The same for the end of your ride and make sure at least the last 10 minutes is at an easy pace to warm down. Make sure you have checked the weather in the area you will be riding and always take a cape or gillet to put on if the weather changes. Always wear slightly more clothing than you feel you need and you can always unzip or take clothing off during your ride. If it’s going to be sunny don’t forget to wear sunscreen not forgetting the back of your leg and hands. This first plan the rides are quite short with no need to eat on the ride but make sure you have a good meal around 2 hours before your ride. You should be drinking every 20mins and use a carbohydrate-based energy drink. Some of your rides are over 1.5 hours and you will need to eat during these. The OTE bars and gels are very good but while you are doing slightly shorter ride try different things to eat and my favourite was jam sandwiches. When the weather is wet and you know, you ride is going to be wet there are some simple things that you can do to make the ride better but the main is there are some great products on the market now to keep you dry but there will be a point where the water will start getting through. Try to wear layers of clothing as if the weather dries up then you can take them off and put in your back pocket. Lots of overshoes have open soles but for when its wet try to find somewhere the overshoe covers the whole shoe not just the top and for the winter months most shoes have a vent in the front to let the wind through to keep your feet cold, place some tape over the vent to stop the water coming in. Wear a cotton cap with the peak the front to keep the spray off your glasses to keep your vision clear. When it’s wet it easy to forget the drink and eat but make sure you feed at the same rate or even more as your body will be working hard to keep warm as well of the effort. If the weather is very bad, try to ride a little higher level to keep warm and a harder short ride maybe is better in these conditions. The delivery of power is the most important thing when riding a bike and being effective in your pedal stroke will share your energy and all the power going to the pedals leading the speed on the road. When you are riding try to keep your cadence to around 90 to 95RPM and focus on keeping your upper body relaxed and avoid pulling on the handlebars. This won’t make you ride any faster and will force your pelvis to relax. This is bad as your pelvis is your platform to push from and is it relax as you push down the pelvis will move up. If you ride with a relaxed upper body you can lock in your core and have a solid platform to push from. The second main point is to pedal leading with your heal, not your toes so you are able to use your ankle to flip over the dead spots on the pedal stroke. By doing this you will be able to pedal less power for the whole 360 degrees and on average this can give you 3 to 4KHP for no extra power. That’s your hands, feet and bum. The main thing will be your bum; always wear cycling shorts that suits you best (the most expensive are not always the best for you) and if you are having trouble try different saddles. When you are starting your ride don’t fasten your shoes too tight, as your feet will swell a little during the ride. When riding always ride with gloves or mitts to help with sore hands and if your wrists hurt a lot then think about raising your handlebars a little or tilting your brake levers a little. You should be drinking every 15mins and use a carbohydrate-based energy drink. For longer ride when you need more than two bottles take a powder sachet so you can just add water when you can. Stay away from fizzy drink but if you do run out of energy a quick can of coke will save the day. For all rides over 1 hour, you should be eating every 20min and from the start of the ride when you won’t be feeling hungry yet. If you get the feeling that you are running out of energy then it’s a little too late and starts getting the food inside you. You should start the ride with high carbohydrate foods using energy bars or cereal bars and jam sandwiches are always good. Make the sandwich, cut into four and wrap each quarter in foil to unwrap during the ride. As you get to the latter stages of you ride move more into sugar-based foods such as energy gels or jelly babies are good. You want to keep you braking to a minimum as you will have to waste energy getting back to the right speed again. When you are riding try to look as far up the road as possible so you are able to predicted is there are any obstacles coming and maybe slow a little by letting off the effort instead having to brake. If you do have slow down by braking try to apply the front and rear brake evenly so you don’t skid by applying the rear brake to much or the front with the back wheel coming into the air. The front brake is the most effective to slow yourself down quickly but always stay on the saddle keep your weight at the rear of the bike to prevent the back wheel leaving the ground and in extreme situations you can go over the front of the bike which would cause damage to you. If you lock up any of the wheels you are out of control of the bike and when either wheel grip again the bike will more than likely to throw you off. Building confidence while cornering: On all rides, I would like you to do the below and when picking a route that has lots of corners practice this but while you do this put half a bar less in your tyres. Braking into corners: Think just as you are driving a car where you should always do all of your brakings before you turn into the corner and then power through the corner. It the same on the bike apart from applying the power but with not braking you will speed up. I used to always cover the brakes in the corner but this is bad because I used to apply the brake a little through the corner. So I used to take my hands right off. Riding on the wheel through corners: From the moment you easy for the corner, I would like to stay on the wheel in front and don’t let it go. You will need to build confidence with this but try to ride on someone you know is good at cornering. Remember the more you have to chase coming out then that will waste energy and the further down the line you are the worst it will be and try to stay in the first 10 at least. Using your weight around the corner: When you have let off the brakes and you are starting to turn do the following. Inside foot up and press all your weight onto the outside pedal. Push all your weight onto the outside handlebar (this is very important as you can get away with the rear wheel sliding but not losing the front). f you feel the front wheel is still going to slip then pull up hard the inside handlebar. This takes a lot of practice but it really works keeping the front wheel from sliding. Sprinting out of the corner: Getting out of the corner fast and make sure you are putting the breaks on straight out of the corner. If you have lost the wheel in front then you can make up the ground doing this but you will have to be careful that you don’t run into the back of them. People worry about hills and yes they are harder but if you ride them at your own pace and rhythm then you should be Ok. Build into the hill by starting easier going through the gears steady trying to keep the same cadence. The big mistake people do is see a hill think oh dear and straightaway engage the bottom gear (you wouldn’t see a hill in the car and go straight from 4th to 1st year). On the hill try to relax sitting down riding a good cadence don’t worry about others dropping you they will wait at the top. If you do start struggling then just focus on are paddling without trying to look at the top and count 20 pedal revs. When you have done this just keep repeating till you get to the top. As you start training you will learn to hate the wind and become obsessed with its direction but try to go out with a head wind and return with the wind behind you. Don’t forget that as a rule the flatter you ride the winder it will be but if you can ride in the lanes that in general are not straight and this will give you short but some rest bite. The right warm up warm down will help the recovery of your muscles and help them from stiffening up too much but with training and long periods of time on the bike you will have some discomfort or pain. To help this while you are riding move around a little like getting out the saddle and stretching your back a little or don’t be afraid to change your grip a little to take the pressure from that area of your hands. If your hamstrings are starting to feel tight then while freewheeling try to drop your heal to the floor while leaning forward to stretch them a little. If your quad starts to tighten unclip your foot out of the pedal on a downhill, sit on your foot and stretch your quad. Don’t worry if you need to stop for a short while to have a little stretch or to relief to pressure off somewhere. If you get a puncture while out on your bike, it’s quicker and easier to just replace the inner tube, rather than faff on trying to patch it up. From experience, we’ve found it’s never a wise idea to wait for a puncture; it’s best to practise the technique at home. Some tyre and tube combinations can be quite tight, needing thumbs of steel, don’t give up, persevere and you’ll get there in the end. 1 x mini OR floor pump. 1 x new inner tube. If you’ve suffered a rear flat, shift your gears to the outermost gear at the back and innermost at the front to make it easier to get the wheel off. If you’ve got v-brakes release them before removing your wheel. This is not something to worry about if you run disc brakes. Release quick-release skewer by pulling outward on the lever. Once open, use your other hand to unscrew the nut so it clears the lips on the fork. Releasing tension in the skewer helps drop the wheel cleanly from the forks. 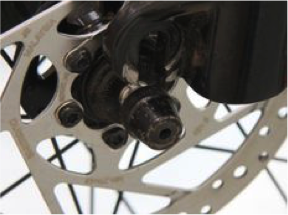 To remove the front wheel, guide it straight down out of the fork. For rear wheels, pull rear derailleur back to keep chain clear of cogs. Guide wheel both down and forward. With wheel separated from the bike, deflate the tyre. Remove dust cap and lock ring. 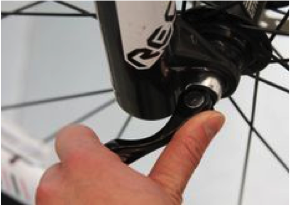 Unscrew and then press the tip of Presta valve to ensure all air is removed from the inner tube. Use thumbs to push bead of tyre towards the centre of the rim. Loosening the bead will make it easier to use tyre levers. Get tyre lever aligned with the spoke. Scoop tyre lever under bead. Once engaged, push down on lever to lift tyre over rim. With end of tyre lever under bead, affix lever to spoke. Remove valve of inner tube from valve hole. Pull inner tube completely out of tyre. Cast an eye over outside of the tyre and use fingers to inspect inside for cause of puncture. Alternatively, always stash a bit of cotton wool in your jersey pocket, so you can run that around the inside – it will snag when it catches on the sharp item, instead of hurting your finger. Connect pump to inner tube valve. If struggling to connect, press down on tyre to push valve fully through valve hole..
Inflate inner tube to pressure noted on sidewall of tube. Start at valve, begin to push bead of tyre over lip of rim. Continue pushing bead over rim. This is easier with some tyre/rim combinations than others. If your combination is tight, push tyre bead into middle channel of rim to create some slack. Use thumbs to ease final section of bead over rim (this will need strong thumbs and may involve swearing). 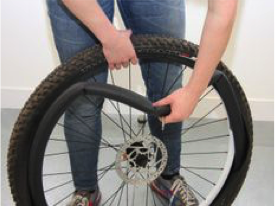 Once bead is over rim, check both sides of tyre to ensure no inner tube is poking out. If so, remove tyre and start again. Remove dust cap, lock ring and unscrew Presta valve tip on new inner tube. Use pump to inflate inner tube so it holds its shape. Insert inner tube valve into valve hole and screw on lock ring. If valve is not pointing straight it can lead to a puncture. Place the rest of inner tube inside tyre. Re-fuelling, cleaning, stretching… what you do when you get back from your ride is important to make sure you are ready for your next outing. Besides water, there are two main things your body needs after an intense ride: carbohydrates and protein. Carbohydrates are necessary to replenish glycogen stores, which can become depleted during a long ride. Protein is needed by your body to build and repair muscle tissue. A 4:1 ratio of carbohydrates to protein is a general guideline for efficient post-ride recovery. When putting together a meal or snack to help you refuel, aim for this 4:1 ratio by combining different food options. Below are ten great foods to eat after an intense ride, and how they benefit your body. Sweet potatoes are rich in carbohydrates, which are essential in the first 30 to 60 minutes after a ride. This is when your body is racing to renew your glycogen stores, so you want to eat something that is high in carbs. Sweet potatoes are also high in vitamin C, which helps to accelerate wound healing, facilitating your body’s recovery. Potassium, which the body loses through sweat, is also plentiful in sweet potatoes. Eggs have a bad reputation for being high in cholesterol. Recent studies have shown, however, that eating eggs has no effect on your overall blood cholesterol level. Eggs are an excellent source of protein, making them a great post-ride snack food. What’s more, the amino acids in eggs are the most digestible to humans, making eggs something of a gold standard when it comes to sources of dietary protein. Eggs are also high in choline, which reduces inflammation. You might think of it as a kid’s afterschool snack, but scientific studies have repeatedly shown that chocolate milk is one of the best recovery foods an athlete can consume. A glass of low-fat chocolate milk comes very close to the 4:1 carbohydrate to protein ratio recommended by experts, but the benefits don’t stop there. The sugars in milk are simple carbohydrates, which are easily broken down by the body. Milk is high in calcium and vitamin D, and has a high water content. If you make your own chocolate milk using raw cocoa powder, you also get the added anti-inflammatory and antioxidant benefits associated with raw cocoa. Many fruits, such as melons, have a high water content, which helps you rehydrate after a long ride. Cantaloupes, in particular, are high in potassium, so snacking on some will assist in replacing lost electrolytes. Cantaloupes are also a great source of vitamin A and beta-carotene, both of which are essential for maintaining the immune system, and are rich in vitamin C.
Nuts are a great post-ride snack because they are high in protein. Nuts have the added benefit of being portable, which is important if you’re not going home immediately after a ride. Nuts are high in unsaturated fats and plant sterols, both of which help to lower bad cholesterol. To maximize their benefits, mix nuts with some dried fruit to get you closer to the 4:1 carb to protein ratio. Like nuts, nut butters are high in protein. Almond butter is rich in calcium, which strengthens bones. It’s also high in magnesium and potassium, which help maintain muscle and nerve functions. Cashew butter is high in iron and has a lower fat content than most other nut butters. Adding nut butter to a fruit, such as banana, increases the benefits derived by your body. For a good 4:1 snack, spread some nut butter on a slice of bread and top with banana. The simple carbohydrates in white rice are broken down more easily by the body than the complex ones in whole grain alternatives. White rice also contains important amino acids necessary for building muscle. For an added nutrient boost, cook white rice in chicken broth or coconut milk instead of water. Chicken is a great source of lean protein. It’s also rich in phosphorus, which helps support the nervous system. Selenium, an essential trace element, is found in abundant quantities in chicken, as is vitamin B6. The high carbohydrate content of berries makes them a great choice for a post-ride snack. Berries can contain up to 92% water, making them great for rehydrating. Berries are also rich in anthocyanins, which reduce inflammation and joint pain. Smoothies are a great post-ride recovery snack because you can make them ahead of time and can tailor them to fit your needs. To ensure you’re getting the most out of your smoothie, add a source of protein, such as whey protein powder or nuts. Carbohydrate sources can include fruit, juice, and honey. Coconut water has a high electrolyte content, so you might want to consider using it as a base for your smoothie. Alternatively, you can use coconut or low-fat milk. Keep your upper-body erect and drop your hips forward until you feel the stretch in your calf (don’t bend over at the waist use your hips to move) Hold for 15-30 seconds, then rotate. The quads are the biggest cycling muscle and deserve a very slow stretch, careful not to pull too hard too fast. Hold for 15-30 seconds, then rotate legs. The pedalling motion develops short and powerful hamstrings. Unlike running, which lengthens hamstrings, cyclists are prone to tightness in these muscles. This is why your “hams” might ache if you’re a cyclist who runs on occasion. Standing, bend over at the waist and let your arms dangle toward the ground, letting the knees bend slightly outward. This stretch benefits greatly from deep, steady breathing you’ll find that you can touch the ground after several slow, deep breaths. Grasp the front of your left knee and lean forward, careful to keep your back straight. Feel the stretch along your left hamstring. This releases the piriformis, a connecting muscle that often tightens after sitting on a saddle. Perform this stretch with both legs. Cleaning your bike regularly helps prevent the build-up of dirt and grease that would otherwise chew through your moving mechanical parts – especially your drivetrain. 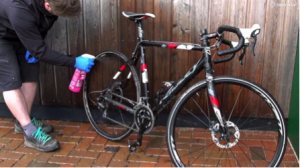 Washing your bike after riding in muddy or wet conditions is even more important. If you’re in a real hurry following a wet ride, you can just spray your drivetrain with water-displacing lube to purge water from your chain and avoid rustiness before a thorough wash.
Use a chain cleaning device along with degreaser to remove built-up grime, mud and oil from the chain. If you don’t have a chain cleaning tool, aerosol degreaser and a brush will work with a bit of extra effort. If there’s loads of oily grime on the cassette and jockey wheels, use degreaser and scrub these before continuing. If you have disc brakes, now’s a good time to spray some degreaser onto paper towels and give them a wipe down to remove any drivetrain grease. Wet the bike with a hose or a bucket and sponge. If you’re using a pressure washer, be sure to stay well back to avoid ruining your bearings. Spray the whole bike with bike wash and leave it to settle according to the manufacturer’s instructions. Start at the top of your bike and agitate any remaining muck from the bike with brushes. Pay special attention to moving parts such as gears and brakes. Rinse the bike with fresh water, then check to make sure you’ve shifted all the grime off the bike, brushing again before rinsing where necessary. Finally, lube the chain by holding the bottle and steadily dripping it onto the chain while turning the pedals backwards. Wipe off any excess, and spray any steel components with PTFE lube, again avoiding braking surfaces.